Summary: Lumbar epidural injections are typically performed blindly or with fluoroscopic guidance. CT fluoroscopy (CTF) can be used to guide needle placement precisely and rapidly, allowing visualization of the optimal needle path and identifying potential problems such as severe stenosis and synovial cysts before needle insertion. Operator and patient radiation dose is minimal when using the intermittent CTF technique and low mAs. By using this technique, just more than 2000 epidural steroid injections have been performed with no major complications. CTF is a useful guidance tool when performing lumbar epidural injections. Epidural injections are commonly used for the treatment of lower back pain in patients for whom conservative disease management has failed and who may wish to avoid surgery. The procedure, which has been performed for well over 70 years, can be performed blindly or, more accurately, with fluoroscopic guidance (1, 2). CT has not been a common way of performing these injections, primarily because of time, radiation dose, and limited scanner availability, although the technique produces excellent anatomic delineation and accurate needle placement. CT fluoroscopy (CTF) allows lumbar epidural injection to be performed rapidly, with very low radiation doses to the operator and patient, while allowing precise needle placement. This technique is especially useful in patients with marked degenerative changes resulting in very narrow intralaminar spaces. With the patient in the prone position, a small area beginning at the undersurface of the posterior lumbar spinous process is scanned to find a suitable approach for the needle. To minimize patient discomfort, a path that avoids contact with periosteum and traverses the minimum amount of posterior musculature necessary should be chosen. After marking the skin at an appropriate spot near the midline, the area is sterilized and anesthetized. A 20- or 22-gauge Touhy needle is then advanced partially into the patient and a CTF image is obtained to gauge depth and angulation (Fig 1A). The needle is then advanced downward onto the outer aspect of the ligamentum flavum by using intermittent CTF guidance (Fig 1B). The stylet is removed and 10 mL of sterile nonbacteriostatic saline is attached via short connection tubing. The needle is slowly advanced into the epidural space by using the loss of resistance technique, followed by the injection of a small amount of dilute contrast medium. A final image is obtained to demonstrate the epidural spread of contrast medium, appropriate needle placement, and lack of intrathecal contrast medium (Fig 1C). In patients who have a documented allergy to contrast agents, a small amount of air or gandolinium may be used as an alternative (Fig 2). Following contrast medium injection, the contrast should be clearly visible at the tip of the needle, as well as extending in an independent location just anterior to the ligamentum flavum. When properly placed, the contrast medium will have a linear appearance although occasionally may appear globular at the site of injection (Fig 3A). Should there be any doubt whether the contrast medium is within the epidural space, additional images either higher or lower than the injection site will confirm the appropriate location (Fig 3B). Once appropriate needle placement has been confirmed, the patient is injected with a steroid and anesthetic mixture (such as 80 mg Depomedrol with 2 mL 0.25% bupivacaine) followed by a 0–2-mL saline flush, and the needle is withdrawn. Epidural Injection Technique as demonstrated in a 38-year-old man with back pain. A, CTF image demonstrates the needle to be appropriately angled toward the epidural space. This image was taken at the lower part of the posterior spinous process; opening used to access the epidural space, between the spinous process and medial facet, is clearly seen. The small triangle of posterior epidural fat is a useful landmark to aim for, although it is not present in some patients, particularly those with severe spinal stenosis. B, The needle tip at the outer edge of the ligamentum flavum, corresponding to a feeling of resistance while advancing the needle, is shown. The tip can be identified by the shadowing artifact extending from it. Notice how the needle has avoided most of the erector spinae muscles during insertion, adding to the comfort level of the patient. C, The final image in this study demonstrates contrast medium outlining the epidural space, tracking along the anterior edge of the ligamentum flavum. Although cross-filling is not seen on this image, it can be shown with a larger contrast medium injection, but this has been found to be unnecessary. In this patient with a known allergy to iodinated contrast material, air was used as a contrast agent. The air defines the epidural space as well as contrast material, confirming appropriate needle placement. Images obtained in an 86-year-old man with scoliosis and spinal stenosis. 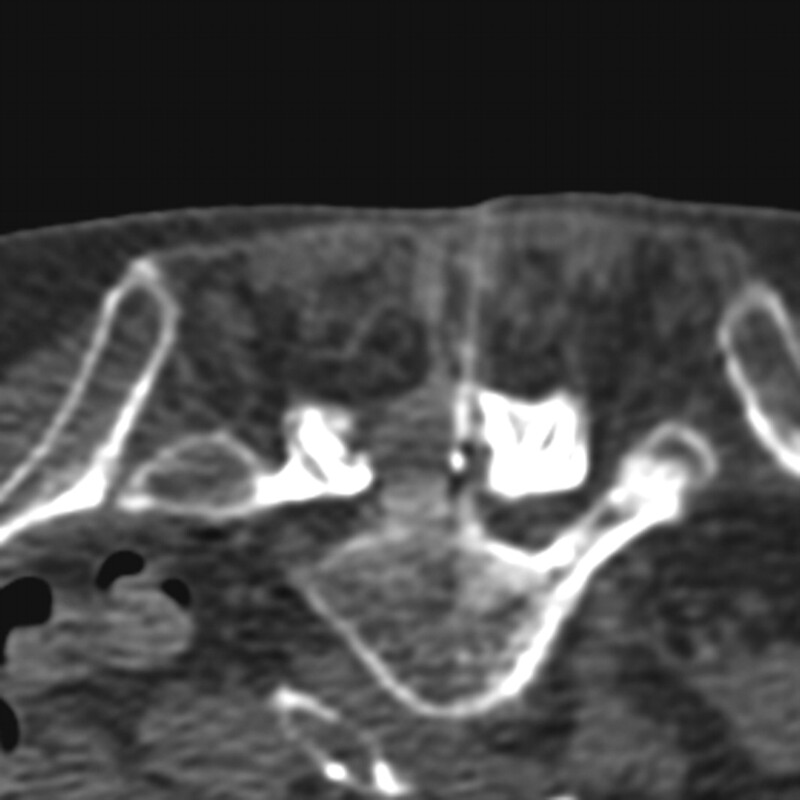 A, In patients such as this one, contrast medium may appear to be within the thecal sac, because it can have a globular shape at the point of injection. In reality, the thecal sac has been displaced to the right, and the patient remained asymptomatic throughout the procedure. B, An image taken 6 mm inferior from the injection site shows that contrast material spreading within the epidural space, confirming appropriate needle placement. Using this technique, slightly more than 2000 epidural injections have been performed at this institution with only three intrathecal injections, all of which occurred early in the experience. These patients had their study terminated once it was determined that the needle was in the thecal sac and they were brought back 3–7 days later for repeat injections, all of which were successful. Only three patients have required bolsters, and there have been no major complications. Minor complications, such as facial flushing, transient vasovagal reactions and insomnia have been sporadically encountered, but none has required pharmacological treatment or hospitalization. The average physician time required to perform these procedures is relatively low and, in my experience, has been equal to less than that spent in fluoroscopic-guided epidural injections. Operator radiation doses were calculated by use of a personal dosimeter worn outside the lead apron at chest level with the operator standing approximately 3 feet from the gantry. In a series of 70 consecutive epidural injections performed on a multisection CT with CTF capabilities, by using mAs of 21 and a kVp of 120, the total operator radiation dose for all 70 procedures was approximately 7.5 mrem, giving an average dose of just over 0.1 mrem per procedure. Epidural injections are among the most common injections used in the treatment of lower back pain and are usually performed either blindly or under fluoroscopic guidance. Although the bedside method is fast and inexpensive, it also results in a large proportion of inaccurate injections, as much as 30% in one study (1). Fluoroscopic guidance allows accurate needle placement when combined with contrast medium injection (1–3) but can sometimes be painful, especially in patients with large ostophytes, scoliosis, or disk space narrowing that has resulted in narrowing of the intralaminar space. In addition, split injections into both the epidural space and thecal sac may be difficult to visualize. CTF has been shown to allow highly accurate needle guidance in a number of procedures, including biopsies, drainages, and selective lumbar nerve root blocks, and the use of intermittent fluoroscopy and a low mA setting allows radiation dose to the patient and radiologist to be minimized (4). In one series of selective lumbar nerve root blocks using CTF guidance, the operator dose outside the lead gown was under 0.8 mrem per procedure (5). In this series, the radiation dose was much less (∼0.1 mrem per procedure), which can be explained by a number of factors, including the use of a newer multisection CTF unit with better shielding, increasing CTF experience, the use of much lower mAs, and lower average sections per case. Radiation dose to the patient has also been greatly reduced by these techniques as well as a reduction to 50–75 mA during the acquisitions of the topogram and scout images. CTF guidance is especially helpful in lumbar epidural injections, because insertion of the needle an approach can be planned to access the epidural space and avoid any osseous structure, even in patients with spinal stenosis or intralaminar space narrowing. On rare occasions, a bolster may be necessary to open the intralaminar space, but this is generally not necessary even when a path is not visible on any one section, because evaluation of adjacent scout images will allow appropriate needle angulation to enter the epidural space. Visualization of the spinal contents before insertion of the needle also enables recognition of potential causes of inaccurate needle placement or procedure failure. These include synovial cysts or cysts of the ligamentum flavum, severe spinal stenosis, as well as epidural scarring and thecal sac deformity in postoperative patients. The linear pattern of contrast medium spread seen on the CT images confirms the appropriate placement of the needle in the lumbar epidural space, and the axial image of the spinal canal is optimal in identifying contrast medium outside the epidural space. Intrathecal contrast medium is easily identifiable with CTF because of the lack of contrast medium within the epidural space, as well as a fluid–contrast medium level in the CSF (Fig 4). In general, <1 mL of contrast medium is typically all that is necessary to confirm appropriate needle placement. Because CTF requires less contrast medium than that for fluoroscopy to confirm needle placement, this allows selective epidural injections in patients with focal disease and less discomfort in those with severe spinal stenosis. In addition, in patients with a known allergy to contrast material, air or gadolinium can be used with CTF, because these clearly defines the epidural space and will allow recognition of intrathecal needle placement. Intrathecal injection is confirmed by visualization of contrast material within the thecal sac, giving a contrast medium–fluid level, while only a small amount of epidural contrast medium is present. In my experience, most patients who have had prior blinded or fluoroscopically guided lumbar epidural injections prefer the CT-guided technique, citing less discomfort during the procedure. This is likely due to minimal needle manipulation, no contact with the periosteum, a path that traverses the minimum amount of muscle tissue and adjustment of the amount of injected fluid depending on the degree of stenosis present. Disadvantages of the CTF guidance include a slightly higher patient cost (0.7 Relative Value Units higher) compared with fluoroscopic guidance as well as the inability to perform this technique in a patient who cannot remain still while in the prone or lateral position. CTF can be used as a guidance tool for lumbar epidural injections and allows precise visualization of the anatomy and needle tip during the procedure. The technique is fast, safe, and highly accurate in proving appropriate needle placement. With appropriate technique, the procedural time is comparable to that of fluoroscopic guidance with a notably lower operator radiation dose, and CTF can be faster and less painful in patients with spinal stenosis or intralaminar space narrowing. Although unlikely to widely supplant fluoroscopic control because of availability and cost, CTF can be considered a viable alternate means of guidance during lumbar epidural injections. Accepted after revision May 10, 2004. 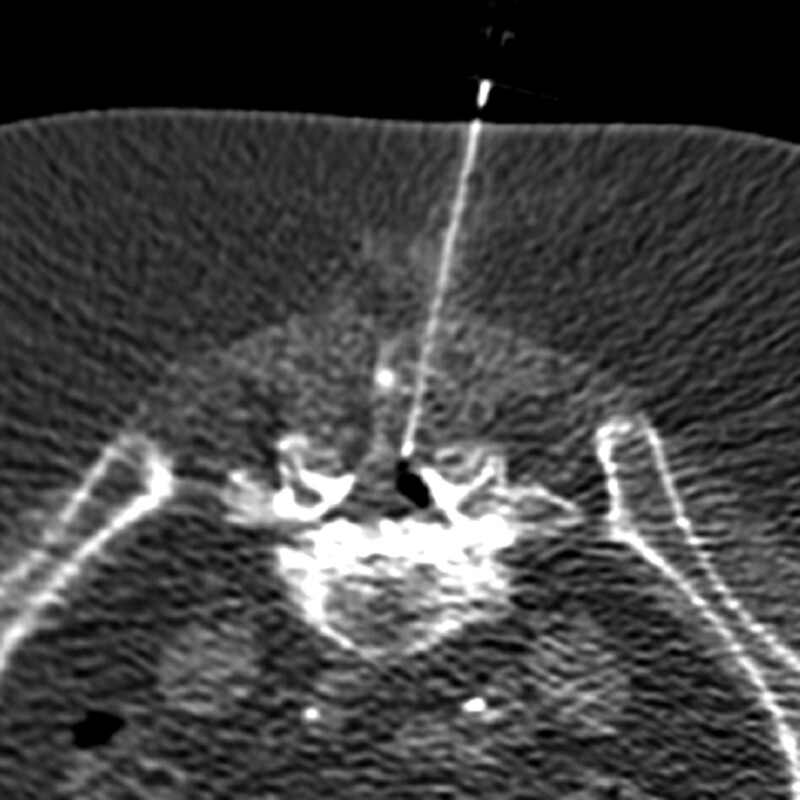 CT-Guided Lumbar Nerve Root Injections: Are We Using the Correct Radiation Dose Settings?